Known to many as the "White House in the Green City"
With exquisite French architecture and a perfect location right in the heart of Ha Noi - the cultural capital of Viet Nam, the Salute Hotel welcomes all its dearest guests with a wholeheartedly pledge to deliver the most satisfaction. Situated in a pretty quiet part of a busy street – Hang Dau Street, the hotel provides its guests with both a tranquil place to stay and quick and easy access to business centers/ spots of attractions. Being one of the first hotels in Ha Noi to receive the internationally acclaimed 2-star award, the Salute Hotel can be quite a pleasant surprise to its guests, since what the hotel has been offering so far has been much more than what is expected of the 2-star standard. "The White House in the Green City",It is the purely French architecture that greets the arriving guests right from the entrance of the hotel. They soon experience the special atmosphere of French and Vietnamese spirits mingling, which soothes all the tiredness of the travelers. Some of the rooms were designed to have access to a small garden place, which is perfect for morning exercises and fresh air all day long. To achieve all this quality, the executive architect who was in charge of designing the hotel was personally sent to France to receive special education and training so that the hotel-to-be-built would be a great success. And so it has been for more than a decade until now. It is the highest quality furniture and fittings that have been carefully selected by the hotel staff to ensure the maximum contentment of the guests during their stays. From the large bathtubs, to the small door mats, all the equipment of every room in the hotel can satisfy the most difficult customers. Designed to facilitate guests with a real homey feeling, each room of the Salute Hotel is even equipped with seemingly small but actually necessary fittings, such as a hairdryer or cotton ear cleaners that are always ready to serve the guests without them having to ask for. And, certainly, what is asked for is always provided as required by the staff. Such meticulous attention to details has been highly regarded by all the guests who have stayed at the Salute Hotel and is one of the competitive edges that the hotel is proud to possess. 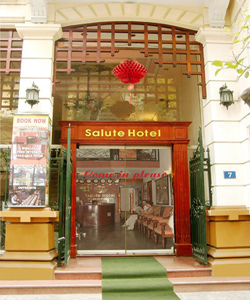 It is the warmest and coziest attitude of the hotel staff that always pleases the guests and guarantees their coming back to the Salute Hotel on their next trips to Ha Noi. All the staff members of the Salute Hotel are well aware of the commitment to serve their guests not only as professionals but also as trusted friends who can make the stays as comfortable and homely as possible. This results in the customer loyalty towards the hotel, that many tourists/ businesspeople always choose the Salute Hotel whenever arriving in Ha Noi. The Salute Hotel - the place to come, to stay, and to return! Located on the first floor, right after the reception desk, the restaurant in the Salute Hotel offers free daily breakfast with a 12-dish menu, ranging from Western, Asian and Vietnamese foods from which guests are free to choose and serve as they wish. Together with the Bar of the Salute Hotel is there to provide guests with many choices of beverages that have been carefully selected and ordered by the hotel. What can be more relaxing than staying at the bar after the end of a long tiring day, sipping from glasses of high quality wine/ alcoholic beverages, listening to the lively, catchy music floating about, sharing stories of the days with your companions before leaving for bed and start a new exciting day tomorrow? Just come to the bar and enjoy yourselves to the fullest.